Pain, tingling and numbness in the hand, commonly at night. Various types of arthritis cause pain and stiffness, particularly after activity. 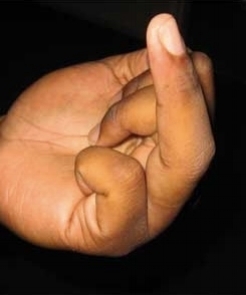 Locking of a finger or thumb in a flexed position. Often painful when it releases. Broken bones in the hand and wrist, commonly after falls, trauma and sport. Even small cuts in the hand and wrist can result in nerve and tendon injury.